This version of Hangman begins with a student drawing a part of speech card from a bowl. After she reads her card aloud to the class, she thinks of a word that matches the part of speech card drawn. She draws the lines representing the placement of each letter on the board. As I write this post, May is right around the corner! 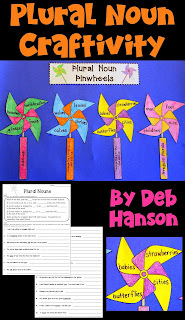 I can't speak for those of you who live where warm weather is common year-round, but I definitely know that students who live in areas with frigid winters are eager for any opportunity to move their classroom activities outdoors! Facilitating an outdoor chalk challenge is a highly-anticipated event for my students. Chalk challenges are quite simple, but kids love them. I divide my students into pairs, and give each pair a piece of chalk. There are many variations to this game, but I'll use a possessive noun chalk challenge as an example. When partners are situated on the ground, you announce a noun. Student A writes a sentence with the singular form of that possessive noun, while Student B writes a sentence with the plural form of that possessive noun. The next time a noun is announced, Student B gets to write first. Announce multiple meaning words (like bat), and students are challenged to write two sentences that show the contrasting meanings of the word. Announce homophones (like bear and bare, but don't reveal the two spellings). Students are challenged to write two sentences that use each correctly-spelled form of the word. 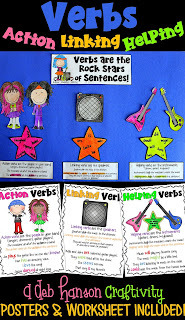 Announce parts of speech (adjectives that begin with c for example), and challenge students to list as many as they can. This is another outdoor favorite! 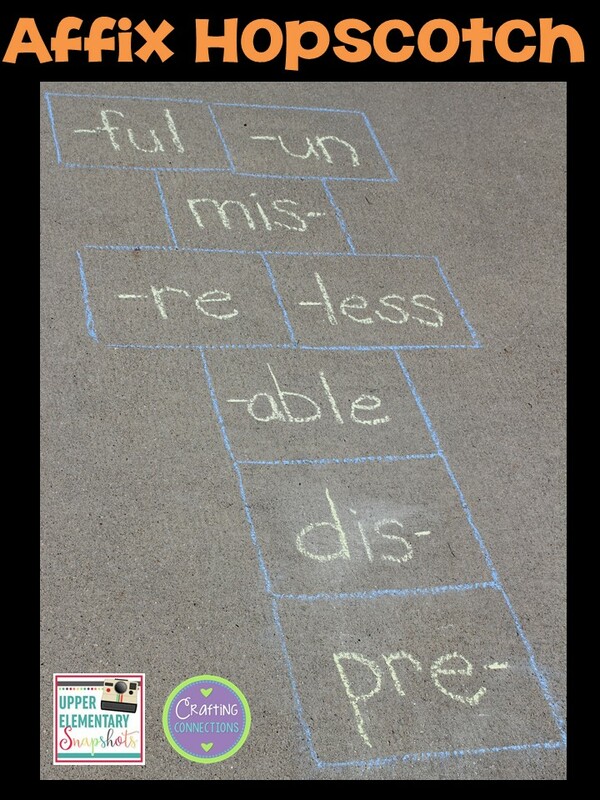 Although not technically a grammar topic, I'm going to share pictures of affix hopscotch. As you can see, you draw a traditional hopscotch pattern with chalk, but rather than filling the squares with numbers, you write various affixes in each square. Proceed as normal, where a student tosses a small rock onto the hopscotch surface, hops along, and when he arrives at the square his rock landed on, he must pick it up, state a word with that affix and its meaning, and then continue along the board. Fill the squares with literary devices (simile, metaphor, idiom, alliteration, personification, onomatopoeia, & hyperbole). The student must state an example of the one upon which his rock landed. Fill the squares with parts of speech. When my students are learning about the 4 types of sentences, this is a favorite activity in my classroom. Each students is given a classmate's name and a fun-size bag of Skittles or M&M's (you could use colored marshmallows or colored cereal, too), and they write sentences for that person, depending upon the colors of their candy. Before they begin writing, I model how to write kind imperatives (Don't forget to sharpen your pencil or Wear a helmet when you ride your bike.). I also tell them that their exclamatory sentences can be complimentary (You're the best goalie ever!) or silly (Watch out for that bear!). 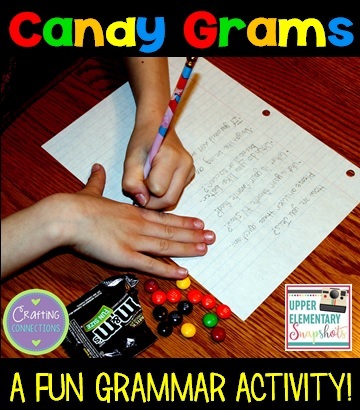 After students have finished their bag of candy (and writing their candy gram), they deliver their note to their classmate, and their classmate is challenged with labeling each type of sentence. 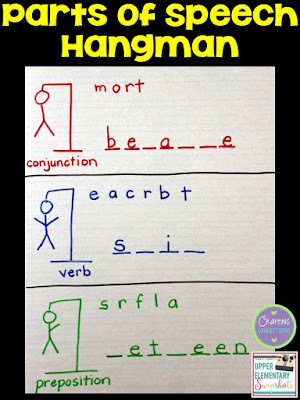 Again, this has many variations, and it can be as simple as having partners draw a tic tac toe board, announcing to the class a random grammar topic (irregular plurals nouns, for example), and when it's his or her turn, each student must provide a correct example of the grammar topic before he or she can mark an X or O on the board. There are also a variety of pre-made Tic Tac Toe printables you can print for your students. 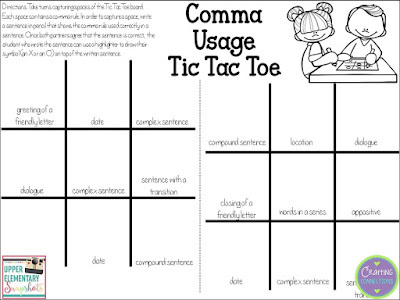 Check out Not So Wimpy Teacher's FREE Parts of Speech Tic Tac Toe games or click HERE or on the image below to download a Comma Tic Tac Toe board. Doing a craftivity is a great way to spice up a rather mundane topic! 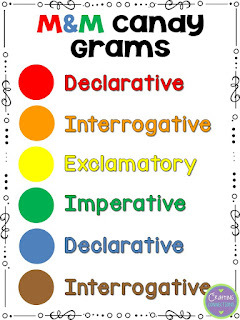 When I create craftivities related to grammar, I usually include some sort of analogy to help students understand the concept. 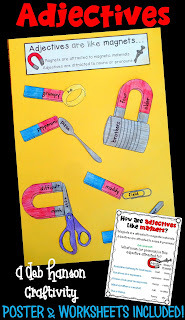 For example, did you know that adjectives are like magnets? 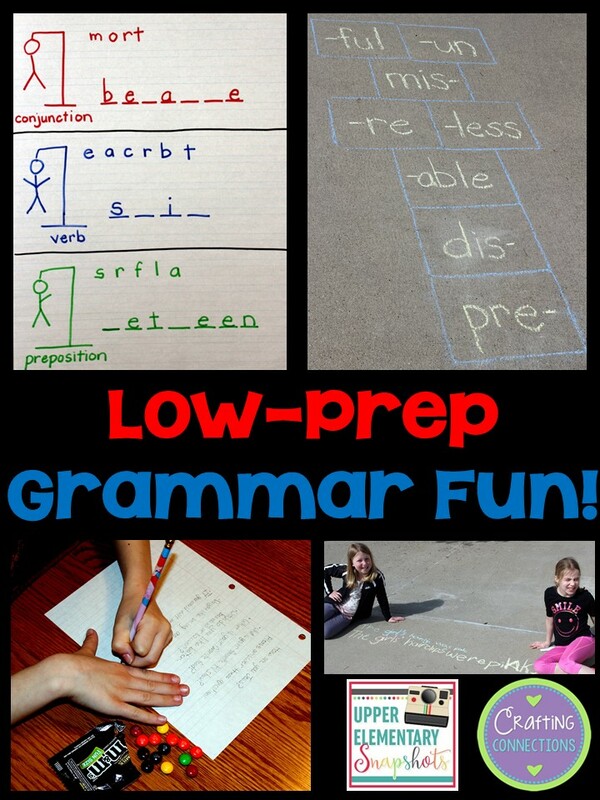 Just a few of my favorite grammar craftivites are shown below! 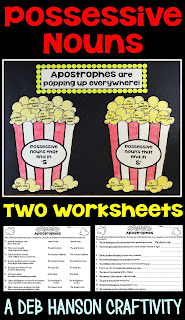 If you'd like a few more printable grammar games, head over to my personal blog, where I've linked up a few additional freebies! Do you have a favorite low-prep grammar game? Feel free to share in the comments below!